Entering the second half of the Readers Lincolnshire ECB Premier League season, just eight points separate the top three with Sleaford leading the way despite seeing their game abandoned in the second innings. And the foot of the table is just as close with nine points between the bottom three. Obus Pienaar is rapidly approaching 900 runs for Sleaford, his 156 helping his side to 269 for four against Market Deeping, who were 145 for six when rain signalled the end of the match. 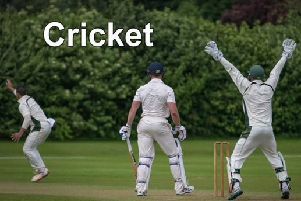 Bracebridge Heath’s comprehensive victory over Skegness took them into second place, one point ahead of Lindum who overcame the challenge of Woodhall Spa. Madhura Perera was the day’s top bowler, taking seven wickets for Bracebridge. Perera tore through the top order, reducing the seasiders to 17 for three and despite a captain’s innings from Sean Chamberlain, who was last man out for 30, Skegness could only manage 112. After Paul Cook was out with the score on 16, Nick John (47) and Matt Carter (45) saw their side to a nine wicket win. Prasanna Jayawardene hit 78 of Woodhall Spa’s total of 160 for six at Lindum, only to see opener Will Wright unbeaten on the same total as the Lincoln side claimed a seven wicket victory. Grantham’s challenge was thwarted by the weather after a man of the match performance from skipper Dan Freeman took them to within 17 runs of victory before the rain intervened. Freeman took five for 52 as Boston finished on 186 for nine and was then unbeaten on 90, with his side’s total on 170 for five, when the match was abandoned. Grimsby Town slipped into bottom place in the table, eight points behind victors Nettleham and nine behind Skegness. Batting first, Grimsby were all out for 170 in the final over of the innings, Steve Crossley making 61. Rhett Bridgens was then involved in two valuable batting partnerships before being out for 66 as Nettleham reached their total with only an over to go and three wickets still standing. Louth continued their revival with a five wicket win over Bourne who were all out for 164, five of the wickets falling to Keaton Critchell. Richard Bell and Jason Collinson were the mainstays of the Louth innings, putting on 69 for the fourth wicket, Bell finishing unbeaten on 41. Results: Woodhall Spa 160-6 (Jayawardene 78), Lindum 161-3 (Wright 78no); Bourne 164 (Critchell 5-51), Louth 166-5; Skegness 112 (Perera 7-39), Bracebridge Heath 114-1; Grimsby Town 170 (Crossley 61), Nettleham 171-7 (Bridgens 66); Boston 186-9 (Freeman 5-52), Grantham 170-5 (Freeman 90no) - match abandoned, rain; Sleaford 269-4 (Pienaar 156, Wilson 55), Market Deeping 145-6 - match abandoned, rain.